Relining of Dentures in both Acrylic and soft Liners. 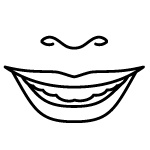 What is a Denture Reline? When teeth are missing, it is normal for the shape of the gums and bone supporting the teeth to gradually change over time. This means that the dentures which once fit well can become loose and awkward. An ill-fitting denture will bang and rub on the gums, irritating and damaging them and causing the underlying bone to shrink away even faster. When this happens, we place an inner lining in the denture called a “reline”, to restore the fit of your dentures. Relines are available in soft or acrylic liners. It is important to have your dentures relined to ensure that they fit snugly, don’t become uncomfortable or cause more gum loss or damage. It also prevents annoying little bits of food from becoming lodged under your plate which can be extremely frustrating. Most importantly, however it will ensure that you maintain enough healthy bone in the gums for years to come so that your dentures fit well into your twilight years.